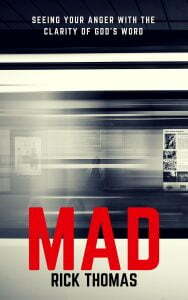 MAD: Seeing your anger with the clarity of God’s Word – (23,500 words) We live in an angry world. Everybody is angry. Even the Christian. It’s a universal problem. If you’re not angry now, you’ll be angry later. Fallen people living in a fallen world are frustrated with their fallenness. Until we see Jesus, expect to be tempted to anger. While it would be convenient to label all our anger as righteous, the humble heart knows better. We will always want things a certain way and we’ll never be able to have all things go our way. This is at the core of sinful anger. We’re vulnerable to anger’s temptations. What about you? What kind of anger tempts you? Mine is impatience. I want what I want when I want it. I’ve always been this way. This is why I wrote a book on anger. I want to share with you some of the things I’ve learned. I don’t expect to ever be fully free from anger’s temptations, which is not the voice of a pessimist, but a word from a person who has lived long enough to know that Adam’s shadow will always be lurking around my life. While some sins have been forever defeated, there are others that have proven to be more formidable. Anger is one of those sins. I hope you will find hope through this book. If you’re a more daring soul, I recommend you read this with a friend. Possibly your spouse. Maybe your small group would benefit from working through this book. At the end of each chapter, I have questions that could prove to be transformative. Thank you for taking the time to read these words. May God’s favor pour over your soul.